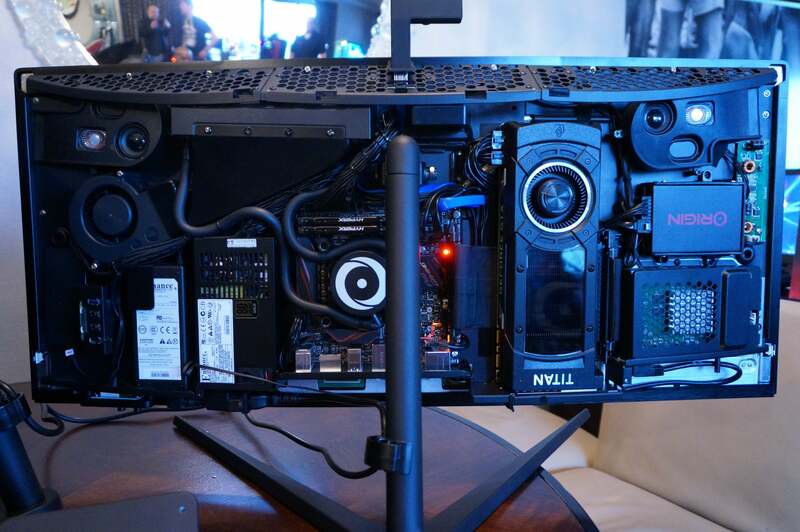 With room for a Titan X and 8-core CPU inside, the Omni is truly made for gaming. 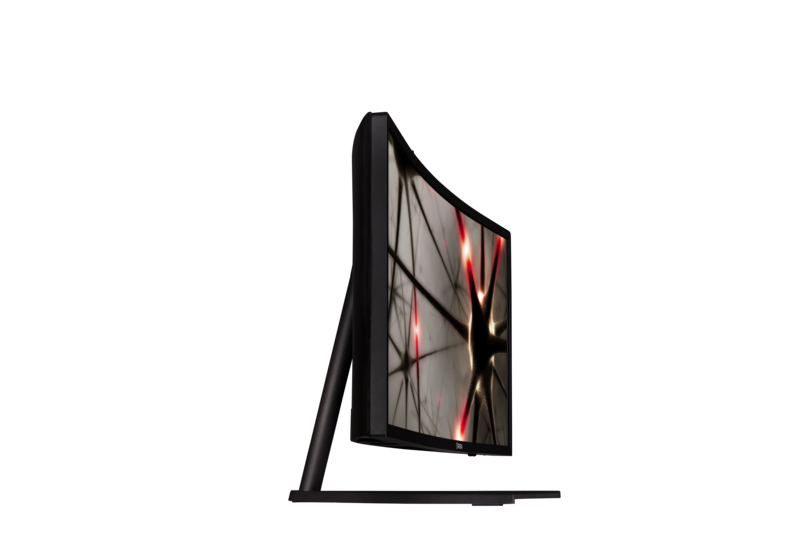 Origin PC's new all-in-one is without a doubt the most powerful curved gaming all-in-one in the world. We also give it bonus points for making us wonder how the hell all that hardware fits into something so thin. 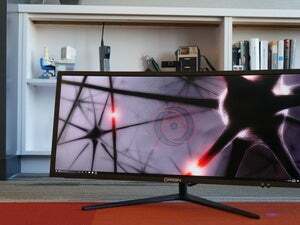 In a world where a typical "gaming" all-in-one tops out with a GeForce GTX 960, the new Omni raises the bar with a GeForce Titan X and liquid-cooled, 8-core Core i7-59660X packed into its 34-inch curved display. Sure, the Omni is a little thicker than the other curved all-in-ones hitting the scene but not so thick that you'd expect this caliber of load-out. It's not the thinnest all-in-one, but it's hard to believe Origin jammed a Titan X and liquid-cooled 8-core CPU inside. Indeed, if seeing is believing, Origin says it will offer an optional transparent back, so there's no question about the hardware residing inside. Ba-dam! Price-conscious gamers will cry foul at the use of a spendy Titan X, but like the 8-core Haswell-E chip, it's optional. Origin said it will offer both Haswell-E and Skylake CPUs in the Omni, and clearly any card up to a Titan X will fit, including the economical GeForce GTX 980 Ti. 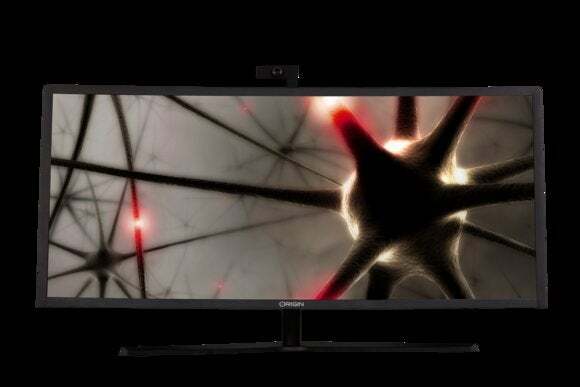 Origin PC's Omni gaming all in one uses mostly off the shelf parts. The Omni wasn't Origin's only "small" news from CES. The company also announced a newly redesigned Chronos small form factor rig, and we're anxious to see what magic Origin has brought to bear on the chassis. Origin is one of the few boutique PC vendors that designs and manufacturers its own cases. The Origin Millennium, for example, is an in-house effort with a host of ground-breaking features, so we have high expectations of the new Chronos. Origin said the new case can house up to an 8-core Core i7-5960X as well as a Titan Z GPU. If you're not familiar with the Titan Z, you're forgiven. When Nvidia released the dual-GPU in 2014 it had limited appeal. Some said the card was useless while others took the kinder view that it was just misunderstood. The Titan Z shoehorned two Titan Black GPU cores onto one card, required a three-slot backplate to run, and cost an insane $3,000. The obvious question: Why run a Titan Z when you could buy two Titan Blacks for $1,000 each and get the same performance or better for two-thirds the price? The answer: You have a compact slim machine that can't run two GPUs—a machine like the Chronos. Why all this backstory? It's hard for me to believe Origin would design a new case for an old, obsolete GPU. I'll bet a case of Duff beer that maybe, just maybe, a new GPU is coming along that fits the same footprint as the Titan Z. Well, we can dream at least.